If you’re looking for peace and quiet, you’ve come to the right place. Spend a day away from the madding crowd and the hustle and bustle of the city. There’s none of that here! Once you get here, prepare to let down your metaphorical hair and relax with a yoga class, whether it’s indoors, on the beach or on a Stand Up Paddle board with Maktub Yoga Studio. Looking for a little more adventure? 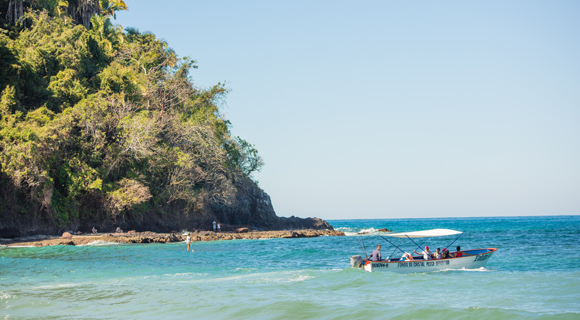 Try Xplore México, a surf, SUP and scuba school with lots of outdoor activities for travelers. At El Estanque you’ll find a natural reserve where you can enjoy a day of watching the local wildlife; don’t miss a visit the turtle camp! The top 5 restaurants in Lo de Marcos are La Tomatina, Arcelias, Secrets, Tony’s and Olivia’s. It’s hard to decide, you just have to try them all! If you prefer your beer with a side of sports, head to the Endless Summer Sports Bar. Should you need to purchase anything during your stay, the local plaza is ringed with shops where you’re sure to find what you need. Traveling with kids? The Casa de los Niños is a great place for them to meet local children and teens. If you’re looking to stay, there are villas, small hotels and bungalows by the beach, or you can always camp out or park your RV in the Trailer Park. And on Saturdays, don’t miss the Tianguis Artesanal, the Handicrafts Market, where you’ll find high-quality organic products, handicrafts, music and a family atmosphere. At the Beach Dog Boarding & Salon your dog or your cat will be treated like royalty—they offer baths, grooming, pet sitting, accessories, toys and even a taxi service!